No-Bake Lemon Cheesecakes are a wonderful quick and easy dessert with delightful flavor and a wonderfully fluffy texture. I make a lot of desserts, but I can safely say that these little No-Bake Lemon Cheesecakes became an instant favorite with us. They have such lovely lemon flavor with an extra kick from the gingersnap crust. Add in a good dose of cool and fluffy, and we are positively smitten. Making these into individual servings means they’re a great make-ahead dessert that you can serve straight from the refrigerator. I love those kinds of individual desserts for easier serving after a meal. Just grab them from the fridge, add a little garnish, and serve! The filling of these beauties is a very fluffy cheesecake with lots of lemon flavor thanks to fresh lemon juice and zest. If you want more or less lemon flavor, you can change the amount of lemon in the filling. Anywhere in the range of 1 to 3 tablespoons of lemon juice will work. I aim somewhere in the middle and get a really nice lemon flavor. I absolutely love the combination of lemon and ginger. The two flavors each have their own zing factor, but they somehow go together perfectly without competing for flavor dominance. 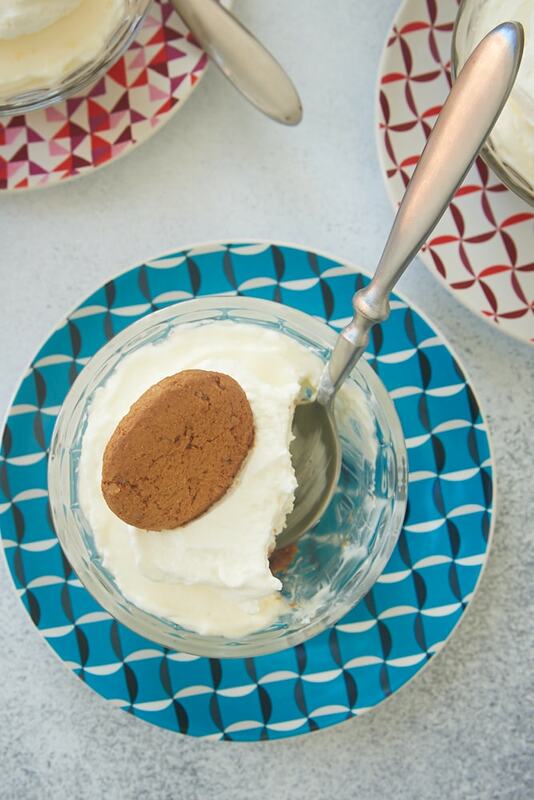 Because of that, I can’t resist using ginger snaps for the crust of these cheesecakes. You can, of course, use a different cookie for the crust if you like. Just substitute the same volume of crumbs of your favorite. Traditional graham crackers are always a good choice, but don’t forget about other varieties like vanilla wafers, shortbread, or even lemon cookies for maximum lemon flavor. These are good size servings, so you can certainly make more than four servings if you want a smaller serving size. You may want to increase the amount of crust for more servings, depending on the size of your glasses and your love of cookie crusts. It’s worth nothing that this recipe also scales well if you want to make these for a crowd. 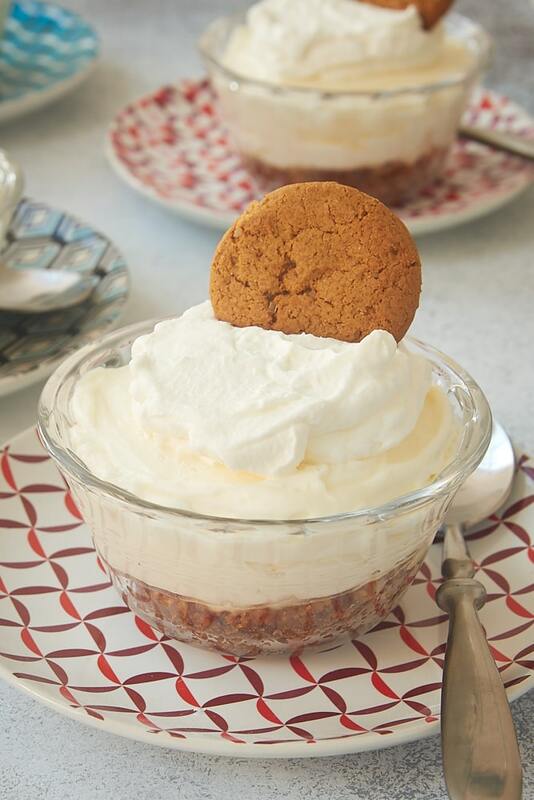 I like to finish these cheesecakes simply with a little bit of sweetened whipped cream and a gingersnap. For something a little different, top with fresh berries, candied ginger, or a sprinkling of extra cookie crumbs. I think you’ll find these No-Bake Lemon Cheesecakes to be a versatile crowd-pleaser! Find more lemon recipes in the Recipe Index. No-Bake Lemon Cheesecakes are a lemon lover’s delight! Combine the cookie crumbs and butter until well mixed. Divide the mixture among 4 individual serving bowls with about 1/2 cup capacity*. Press gently into the bottom of each bowl. Using an electric mixer on medium speed, beat the cream cheese and sugar until thoroughly combined and smooth. Mix in the lemon juice and zest. Place the cream in a separate bowl, and use an electric mixer with a whisk attachment on high speed to whip the cream until soft peaks form. Divide the filling among the serving bowls. Chill at least 2 hours before serving. 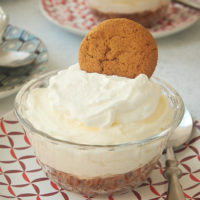 If desired, top with sweetened whipped cream and more cookies. 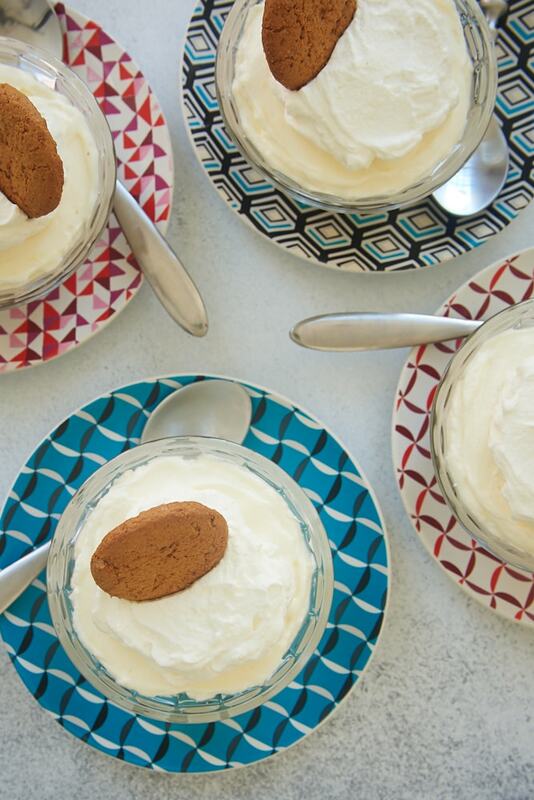 *The ones I used in these photos are Pyrex custard cups.